The Famous ‘Rose Gold’ Finish on Vintage Omega Movements: Not All that Glitters… – I Already Have a Watch. 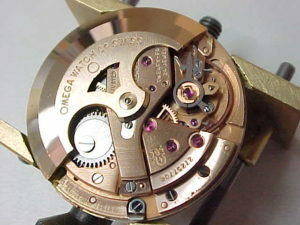 Omega Caliber 564 movement circa 1968 with the famous "Rose Gold" copper finish. In talking recently with another collector not as familiar with Omegas I was reminded of something that I haven’t seen mentioned lately: the discredited but oddly persistent myth of the “rose gold” finish on vintage Omega movements. Sorry, Omega. That famous iconic “rose gold” finish for which vintage Omega movements became known actually didn’t contain any gold at all. There are various reason for the persistence of the myth. It does admittedly look very much like rose gold. And perhaps there is some simple confusion with special calibers like the 863 that actually did have gold finishing. Perhaps part of the reason too is just out of simple convention or convenience, or using “red gold” simply to refer to the coloration. But not all that glitters is gold. Exasperated with the continued myth, collectors Paul Delury and Rob Berkavicius finally got together years ago to put it to the test. They sent samples of Omega parts to a metallurgical lab for a deliberate analysis. Does winding an automatic on a regular basis cause any damage, e.g., my vintage Omega runs down over the weekend, or if I don’t wear it for a couple of days. A watch winder is a solution, but what if I just wind it fully (15 winding turns) on Sat and Sun night so it is still running on Monday morning?